Former UFC women’s bantamweight champion Ronda Rousey has become one of the biggest superstars in WWE since making her transition from the Octagon to the squared circle but it appears her new career will be put on hiatus. On Monday, Rousey dropped a message on Instagram sharing a kiss with her husband, UFC heavyweight Travis Browne, along with the tag ‘impregnation vacation’. 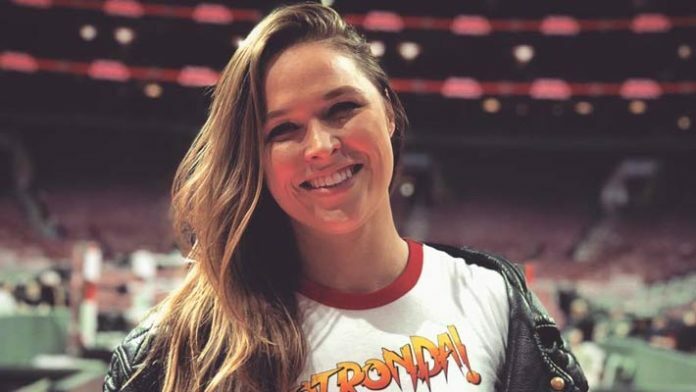 Rumors had swirled before Rousey’s appearance at WrestleMania 35 that she would be taking a break from her professional wrestling career after spending the last year dedicated to WWE. Rousey has long coveted the chance to start a family but she put that on hold after her UFC career was finished as she looked to make the move into WWE instead. Over the past year, Rousey has become one of the biggest names in the professional wrestling industry and she took part in the first ever women’s main event at WrestleMania a couple of weeks ago. “I’ve not kept it a secret that I would definitely want to start a family,” Rousey told ESPN in January. “But how do you go about doing that? I love this way more than I thought that I would. So do you just keep going until you just happen to get pregnant? Or should you stop and go try and get pregnant? Or is going and trying to get pregnant putting yourself on the spot and then you’re less likely to get pregnant? I’ve never had a baby before, I don’t know these kinds of things. When Rousey inked her deal with WWE, she signed on for a multi-year contract that reportedly runs through at least 2021. It’s entirely possible that Rousey returns to WWE in the future to work a less hectic schedule after starting a family but right now it doesn’t seem like any decisions have been made. For now, Rousey is going to enjoy some time at home with her husband as they look to start a family of their own while she’s on hiatus from WWE.